NYU Shanghai is a new research university in Shanghai. I will briefly provide an overview of NYUSH and also discuss opportunities for part-time teaching positions. I will then discuss a recent research project. Developing efficient privacy mechanisms in social networks requires an understanding of content that users consider sensitive. We explore the feasibility of automatically finding accounts that publish sensitive content in Twitter by determining the percentages of anonymous and identifiable followers. To this end, we first consider the problem of automatically determining if a Twitter account is anonymous or identifiable. We then classify an account as sensitive content based on the percentages of anonymous and identifiable followers the account has. We apply our approach to 100,000 accounts with 404 Million active followers. The approach uncovers sensitive accounts in many diverse themes, including themes not commonly labeled as sensitive, such as accounts related to depression, obesity, and anorexia. To validate our approach, we apply Latent Dirichlet Allocation (LDA) topic analysis to the tweets in the sensitive and non-sensitive accounts. 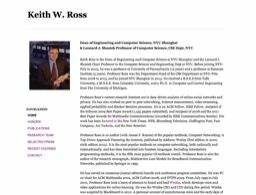 Bio: Keith Ross is the Leonard J. Shustek Chair Professor in Computer Science at Polytechnic Institute of NYU. Before joining NYU-Poly in 2003, he was a professor at University of Pennsylvania (13 years) and a professor at Eurecom Institute (5 years). He received a B.S.E.E from Tufts University, a M.S.E.E. from Columbia University, and a Ph.D. in Computer and Control Engineering from The University of Michigan. Professor Ross has worked in security and privacy, peer-to-peer networking, Internet measurement, video streaming, multi-service loss networks, content distribution networks, queuing theory, and Markov decision processes. He is an ACM Fellow, IEEE Fellow, recipient of the Infocom 2009 Best Paper Award (1,435 papers submitted), and recipient of 2008 and the 2011 Best Paper Awards for Multimedia Communications (awarded by IEEE Communications Society). His work has been featured in the New York Times, NPR, Bloomberg Television, Huffington Post, Fast Company, Ars Technia, and the New Scientist. Professor Ross is co-author (with James F. Kurose) of the popular textbook, Computer Networking: A Top-Down Approach Featuring the Internet, published by Addison-Wesley (first edition in 2000, sixth edition 2012). It is the most popular textbook on computer networking, both nationally and internationally, and has been translated into fourteen languages. Excluding introductory programming textbooks, it is the fifth most popular CS textbook overall. Professor Ross is also the author of the research monograph, Multiservice Loss Models for Broadband Communication Networks, published by Springer in 1995. From July 1999 to July 2001, Professor Ross took a leave of absence to found and lead Wimba, which develops voice and video applications for online learning. He was the Wimba CEO and CTO during this period. Wimba was acquired by Blackboard in 2010.